In the last few weeks IBM has released some fairly radical adaptations into the tech world. While we don't normally post press releases on things of this nature, the new technologies announced could have strong implications. Bearing that in mind, a little knowledge can go a long way. So without further ado, here's a look forward at some of the newest tech to hit the industry. EAST FISHKILL, N.Y. and MUNICH, GERMANY--Dec. 7, 2000--IBM and Infineon Technologies AG (FSE/NYSE: IFX) today announced plans to jointly develop a breakthrough memory technology that could significantly increase battery life of portable computing devices and lead to "instant-on" computers. The two companies have signed an agreement to collaborate in the development of Magnetic Random Access Memory (MRAM), which uses magnetic, rather than electronic, charges to store bits of data. MRAM may significantly improve electronic products - from computers to cell phones to game systems - by storing more information, accessing it faster and using less battery power than the electronic memory used today. MRAM also retains information when power is turned off, meaning products like personal computers could start up instantly, without waiting for software to "boot up." 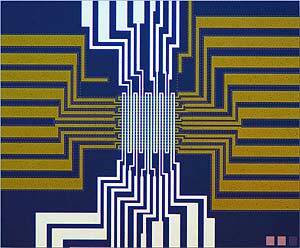 IBM Research pioneered the development of a miniature component called the "magnetic tunnel junction" as early as 1974, eventually adapting it as a means to store information and to build an actual working MRAM chip in 1998. Using this IBM technology, coupled with Infineon's considerable expertise in creating very high density semiconductor memory, the companies believe actual MRAM products could be commercially available as soon as 2004. 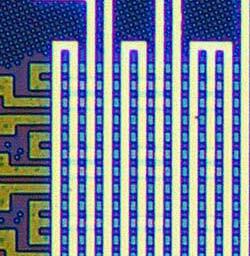 "MRAM has the potential to replace today's memory technologies in electronic products of the future," said Bijan Davari, IBM Fellow and vice president of technology and emerging products, IBM Microelectronics. "Today's announcement represents a major step forward for MRAM, quickly moving the technology out of the pure research stage into product development." IBM and Infineon have more than 10 years experience successfully developing new chip technologies together, including traditional Dynamic RAM (DRAM), logic and embedded-DRAM technologies. "Infineon and IBM are combining their technological capabilities and resources to help bring MRAM technology to maturity on a fast track," said Wilhelm Beinvogl, Senior Vice President of Technologies and Innovations, Memory Products, Infineon Technologies. "Our proven track record in the joint development of advanced memory and logic technologies is thus further extended by a very exciting and new kind of technology. For Infineon, MRAM technology offers equally interesting potential both for embedded logic products and standalone memory chip applications." MRAM combines the best features of today's common semiconductor memory technologies - the high speed of Static RAM (SRAM), the storage capacity and low-cost of DRAM and the non-volatility of Flash memory. This non-volatility carries significant implications, especially for emerging pervasive computing devices. Memory technologies like DRAM and SRAM require constant electrical power to retain stored data; when power is cut off, all data in memory is lost. A laptop computer, for example, works from a copy of its software stored in memory. When turned on, a working version of the software is copied from the hard disk drive into memory so the user can access it quickly. When power is turned off and then back on, the process has to start over. By using MRAM, the laptop could work more like other electronic devices such as a television or radio - turn the power on and the machine jumps to life. Non-volatility can save power as well. Since MRAM will not need constant power to keep the data intact, it could consume much less than current random access memory technologies, extending the battery life of cell phones, handheld devices, laptops and other battery powered products. A combined workforce of approximately 80 IBM and Infineon engineers and scientists will be assisting with the project. Development work will be conducted at IBM's Thomas J. Watson Research Center in Yorktown Heights, NY, IBM's Almaden Research Center in San Jose, Calif., and the IBM Microelectronics Semiconductor Research & Development Center (SRDC) in East Fishkill, NY, with additional design and test activity at IBM's facility in Burlington, VT.